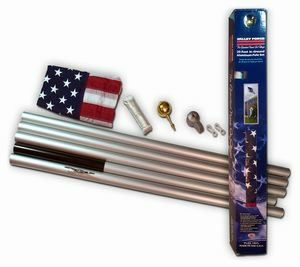 View this flagpole and our entire selection of flagpoles fully erected in our showroom. Install it yourself or have us install it for you! Withstands approx. 35 mph winds - Recommended only if surrounded by trees. Not in an open area. Toledo can get winds up to 80-90 mph. Includes 3'x5' Nylon U.S. Flag - Made in the U.S.A.